A long time coming but here it is: comics about self-affirmation and belief in your true core’s strength. The answer was right there all along. So far this has been a good week! My friend the Owl sent me a job posting for a website looking for someone to blog about non superhero graphic novels. This is my thing! I have a deep background and many ideas to share on this subject, and I am professionally trained to write and to deconstruct texts. Yet, knowing about the process of reading open calls for submission triggers my fear of rejection. What if, despite my knowledge that I am perfect for a job, I fail? What does this say about my belief in my abilities, if I cannot even escape the slush pile? This is the sort of thing that tears me up and prevents me from putting forth the effort. But I put forth the effort. And I made the cut. My little essays are going up as guest posts and if everything works out I will probably get my own column. To write about non superhero graphic novels. Which is a thing I would be doing anyway. Another fun thing that just happened was the advent of my 100th follower on this blog. Hello! Everything’s coming up Dragon! This entry was posted in comic, dragon, dragon comics and tagged believing, blogging, comic, confidence, dragon, graphic novels, inner child, self-esteem, webcomic, writing on February 25, 2015 by littledragonblue. OK, I lied yesterday. This is at least a 3-part comic. Maybe longer. Apparently I can get away with whatever it is I’m doing here, because yesterday was this blog’s best-ever day for page views. Yeah, the snake’s sort of a jerk. We’ve all met the snake. So: conflict! Is Dragon just going to lie down and take this crap? Can she retaliate? Who let that snake in, anyway? Come back tomorrow for more answers. 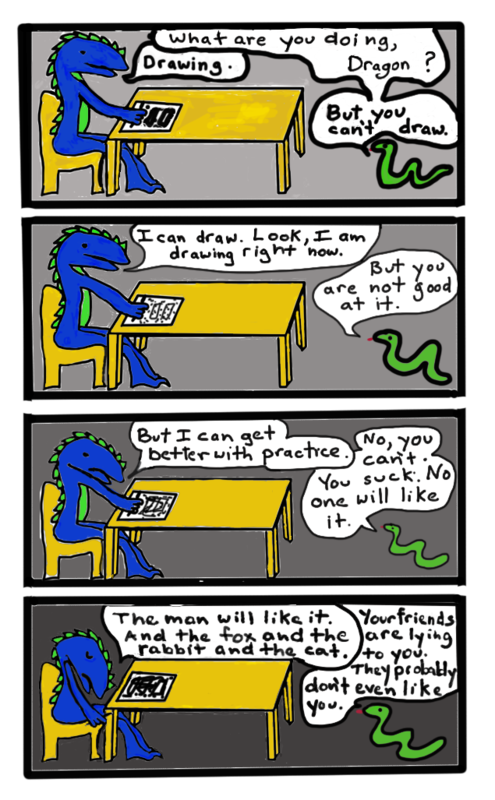 This entry was posted in Comics, Dragons and tagged art, bullies, comics, confidence, criticism, critics, dragon, drawing, self-esteem, snake on August 19, 2014 by littledragonblue.